It wasn’t a too early start this time as my first booked photo shoot wasn’t until nearly lunchtime, so we set off at half eight, my plan was to not be so tired this time, this didn’t quite work out, I managed about two hours sleep the night before and woke at half five. We arrived at about eleven and found a parking space (fun in London on a Saturday when your vehicle is too high for a multistorey car park), after we found one we headed into Earl’s Court, myself, my Mum, my cousin and a friend with her 17 month old, I checked in at the organisers desk to get a piece of paper allowing me to queue jump then headed for my first photo, on the way we were stopped by a couple of young ladies in cosplay who wanted a photo with me, one was Snow White I believe (I’m no expert on Disney dresses), this was something that would occur throughout the convention, people coming up and wanting pictures or just complementing me on my costume. 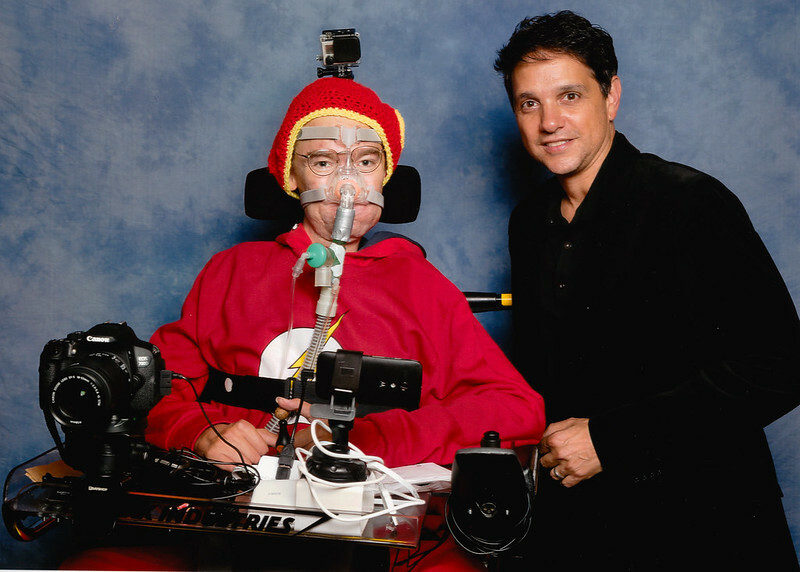 I suppose I should mention the costume really, I decided on The Flash as it seemed pretty simple, I had a red onesie I’d bought for an Iron Man outfit earlier in the year, yellow rugby socks from ebay wer cheap, a long sleeve sweatshirt with The Flash logo also from ebay, some lightning bolt stickers for my chair and I’d spotted a crocheted Flash hat on the net & asked my best friend to make me one :) The costume worked well although it did get a little warm at times. Back to the convention, we arrived five minutes too late for Alan Ruck’s photoshoot, the crew were very good and said if I came back at half five they would try to sort something out. After this we wandered around for a while, it was far less busy than summer had been so we could actually look at the stalls and see the celebrities signing autographs. My friend plucked up the courage to approach Dave Prowse, somehow during this process she turned from a strong woman training to be a nurse into a giggly, shy, schoolgirl! Dave was great and they had quite a long chat (with a queue forming behind her). 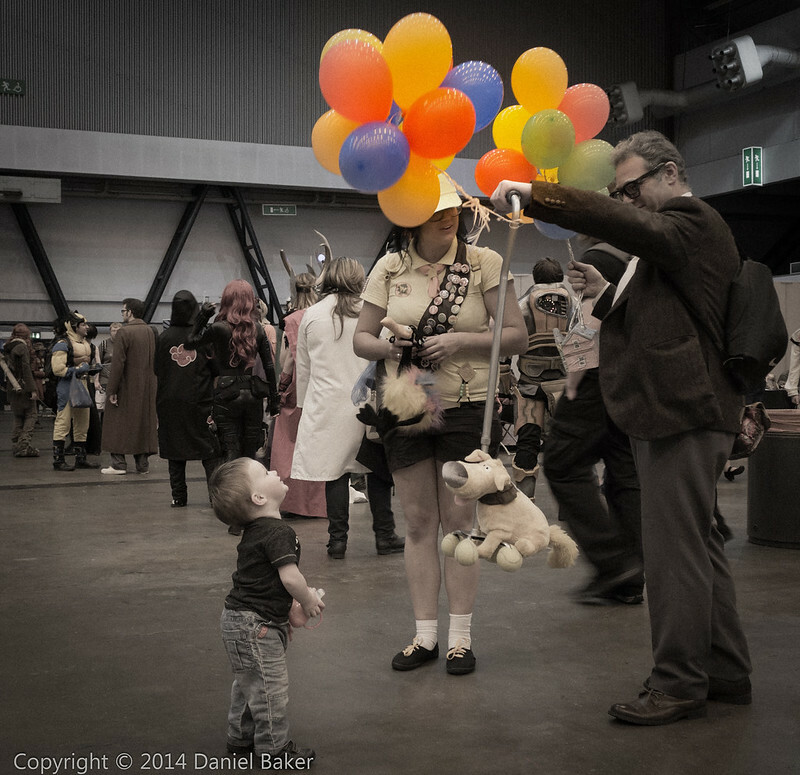 We then looked around some more, Ethan woke up and wanted to run round, he was great, going up to cosplayers and saying “hiya”, I suspect a fair few of them left comic con broody. We made good time and arrived home before nine, I returned to a 40 banner and balloon, quickly got in bed and had an early night. 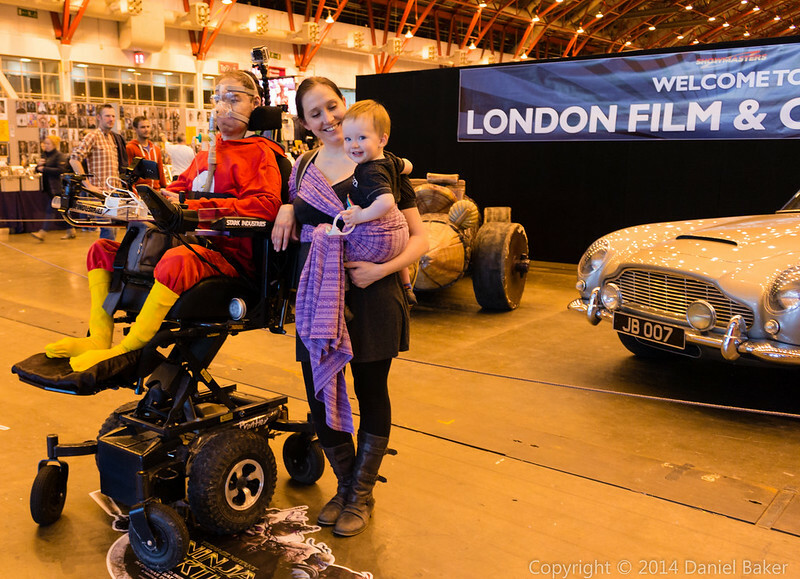 This entry was posted in Geeky and tagged 2014, Daniel Baker, LFCC, LFCCW, London Film and Comic Con. Bookmark the permalink.